LP | "Crowned In Terror"
"Crowned in Terror" is the fifth album by the swedish melodic Death Metal band THE CROWN. 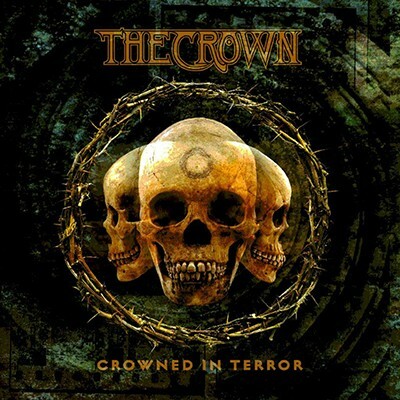 This is one of two albums by THE CROWN not to have Johan Lindstrand on vocals (although he did some backing vocals here), instead Tomas Lindberg handled the vocal duties. Later, the vocals were re-recorded by Lindstrand and the album was re-released as "Crowned Unholy". 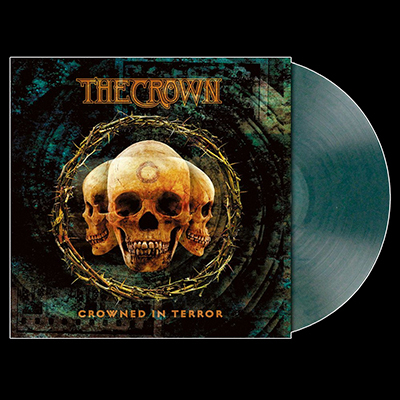 The eleven songs on this album were recorded and mixed between september 2001 and january 2002 in the Studio Mega, Varberg, Sweden and compared to their previous albums, "Crowned In Terror" has the cleanest sound. Despite the excellent production, it manages to be rawer, more violent, more catchy and yet more melodic than the rest. In fact, it is more Death Metal than Thrash for once. In the year 2002 METAL BLADE RECORDS, USA did the first issue of this album. Limited edition of 200 hand-numbered copies on Clear Teal Marbled vinyl, this album comes with lyric insert and double-sided poster. This re-issue is strictly limited and available in different colours, all songs got a special mastering for vinyl.